The Port of Goole showcased its ability to handle any type of cargo with a number of 20 tonne heavy lifts this week. The project cargo lifting operation saw meticulous planning from a team made up of ABP operatives and heavy lift specialists, Collets who ensured that the pieces were handled with care and placed directly onto road transport. 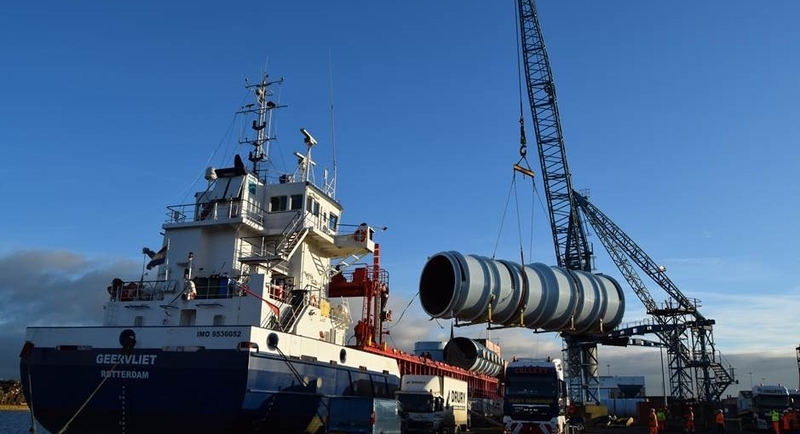 Air cooling condenser components, the heaviest weighing 23 tonnes, were lifted from the vessel which had brought the pieces over from Rotterdam. The components were destined for Ferrybridge Multifuel 2 (FM2), owned by energy providers SSE. After the news that Ferrybridge coal-fired power station was to close last November, the future of the site had been uncertain until SSE took ownership of the estate. Whilst commercial operations at the site are not due to commence until 2019, the Port of Goole was able to get a glimpse at some of the components destined for the new project. The air cooling components are crucial in ensuring the high performance of FM2 as during the operation of the plant, steam is generated by the boiler heating process, which in turn drives a turbine and produces electricity. The Air Cooled Condenser (ACC) cools this steam. The steam goes into the ACC, which has a series of fans, cool air is drawn through the fans and cools the steam. Martin Szakal, operations manager for Goole, said: “We’re pleased to be able to assist in the delivery of the eagerly anticipated FM2 project. Once fully operational, FM2 will be revolutionary for the region as it will generate energy from waste materials, saving it from landfill. FM2 could treat up to 675,000 tonnes of waste derived fuels each year.